Centrifugal Juicers- The Centrifugal juicer is the most common and is the oldest juicer design. 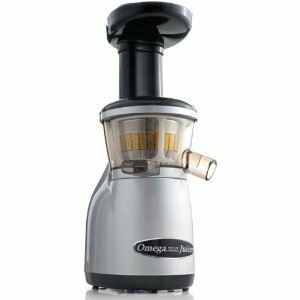 It's usually the most affordable juicer and is great for someone just starting out with juicing. The Centrifugal juicer spins at high speeds and through the action of the shredder disc separates the juice from the pulp and pushes the juice out through the strainer basket into your glass container. This type of juicer is good at juicing most fruits and vegetables including carrots, beets, cucumber, and celery, as well as fruits apples, pineapple, mango, and pears. Masticating Juicers- Also known a single gear juicer extracts juice from fruits and vegetables through the efficient action of a single auger. The augur breaks down the walls of the plant cells through a grinding motion then squeezes the juice by crushing the produce against a screen. 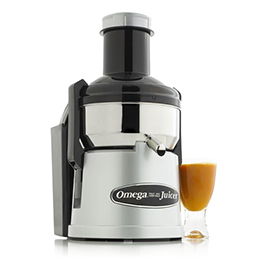 Due to their lower speeds (80 -100 rpms), the single gear juicer operates quietly, limits oxidation and foam, and releases the nutrients and phyto-chemicals that are so important to healthy diet. The single gear masticating juicer has a longer operating life than the centrifugal juicer due to its relatively slow speed; it creates larger amounts of juice from the same quantity of produce, and produces a healthier product then the higher-rpm juicers. Twin Gear Juicers- The twin gear juicer or sometimes called a triturating juicer use two augers or gears to extract the juice from fruits and vegetables. This juicer triturates (crushes, grinds, and pounds) the produce between two interlocking augers that release more phyto-chemicals, nutrients, and enzymes. The twin gear juicer operates at low rpms (80 -110) and, along with their twin gears, it's the most efficient juicer available. The Twin gear juicer is capable of quietly extracting more juice from fruits, vegetables, wheat grass, spinach, and herbs than other type of juicer. The pulp produced by a twin gear juicer is the driest of all. 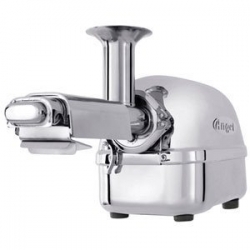 The twin gear juicer can also make baby food, nut butters, fruit sorbets, and have the capability, with the included attachments, to make pasta, bread sticks, and rice cakes.